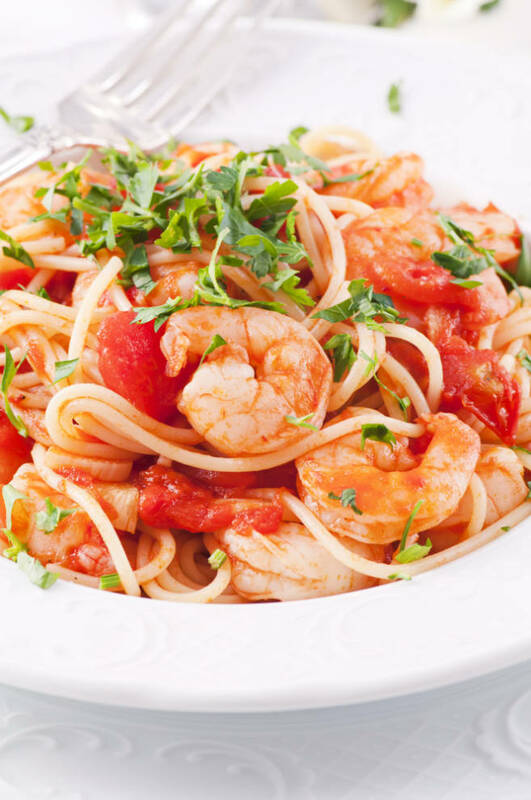 As a garlic lover I could not wait to make this delicious sounding pasta and shrimp dish and when i did I was not disappointed. Since I first tried it I have very few suggestions or tips for you readers. The only thing I would say is if you are trying to eat more vegetables like I am then you can try adding some green peppers, mushrooms or some sliced onions. Preheat the oven to 400 degrees F for the bread. Heat the oil in a 12 inch skillet over medium heat. Add the garlic and cook until it’s golden. Stir the sauce and red pepper in the skillet and heat to a boil. Reduce the heat to low. Add the shrimp and cook for 5 minutes or until it’s cooked through. Toss the spaghetti with the shrimp mixture. Sprinkle with the parsley. Cut the bread into 2 inch diagonal slices. Serve the bread with the spaghetti mixture.